I was trying to think of some catchy title for this to tie into the 4th, and I had a slew of them, but none quite captured what I was trying to convey, so I decided that straight-forward was the way to go. Because this is a great summer BBQ addition and frankly, this is just damn good all year! 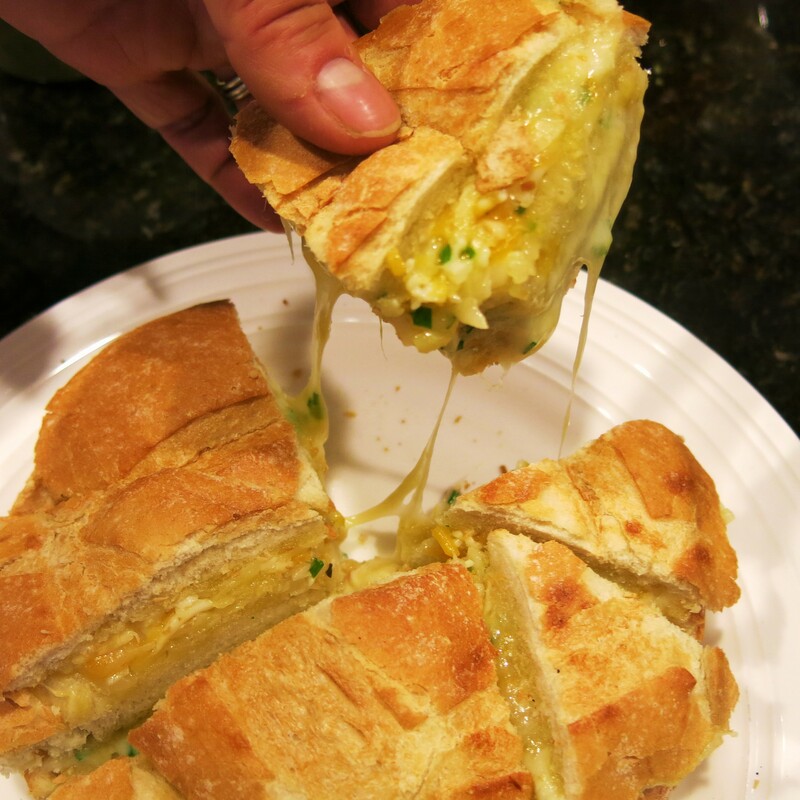 I don’t know what else to tell you except this is exactly what the title says: Cheese-Stuffed Garlic Bread. But really, it is so much more. It goes on the BBQ about 15-20 minutes before whatever you’re grilling will be done. Even though the loaf is foil-wrapped, the exterior will be crispy good, the interior melty good and the whole thing will be redolent with heavenly garlic. I have a second version of this, but that’s another post. What can I say? I think it’s always go to have options and something to look forward to. Anyway, you’ll note the recipe, and I hesitate to call it that, because it’s so straight forward you really don’t need proportions. You’ll note that the ingredients are really approximations, and that’s fine. This is forgiving and frankly, it best made a few hours before you’re going to heat it to its full cheesy, crispy, divinely garlicy finale! In a small bowl, combine the olive oil and garlic; stir until well combined and set aside. I prefer to make this several hours ahead and just let it sit on the counter. When ready to prepare, slice the bread horizontally, into reasonably equal thirds or in half if the loaf is only a couple of inches high. Unstack the loaf and lay cut side up. Remember, the middle layer will have to cut sides. Brush or drizzle over the bottom third “slice” with about 2 teaspoons of the garlic-oil and smear it around evenly. Repeat with the remaining “slices” (you’ll do the middle slice when you reassemble the loaf). Now combine the cheeses, with the herb(s) of choice; toss together. 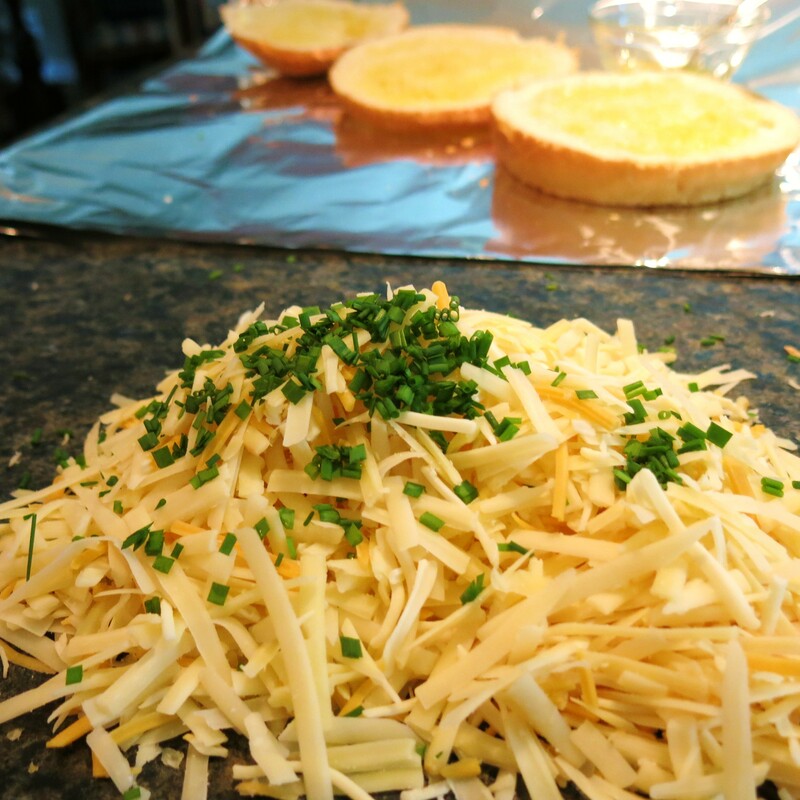 Take a large handful of the cheese mixture and place on the bottom cut side and spread it evenly to the edge. Before placing the middle slice on top of the cheese, turn it over and brush or drizzle with a couple of teaspoons of the garlic-oil mixture. Turn it over and place it on top of the cheese-topped base. Place the remaining cheese, another big handful on top of the middle layer and spread to the edge. Place the top slice, garlic-oiled, cut-side-down on the cheese-topped middle layer. 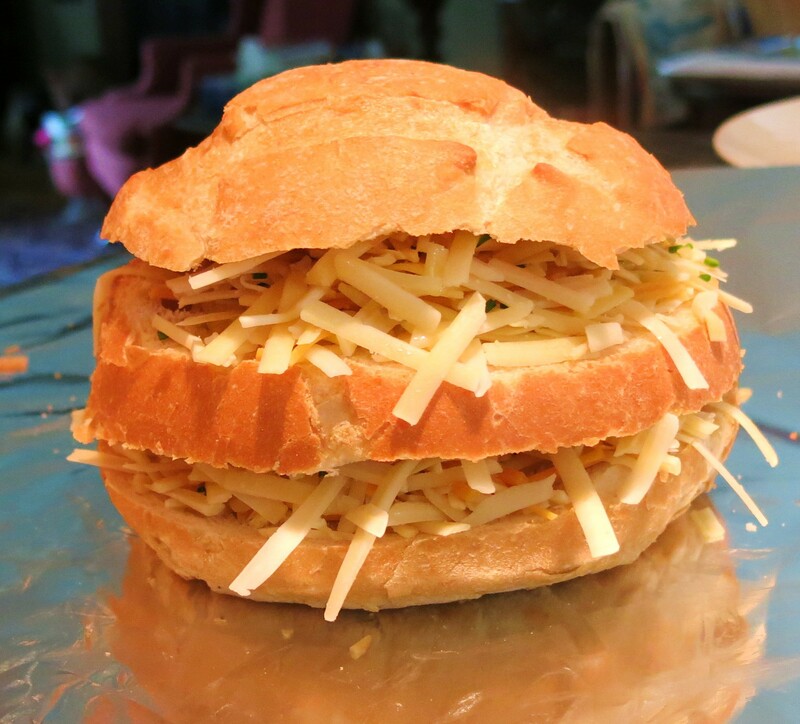 Wrap the whole thing in aluminum foil and set aside until you’re ready to grill or place in a 350°F oven for 20-25 minutes or until the exterior of the bread is crispy and the cheese is melty-good. 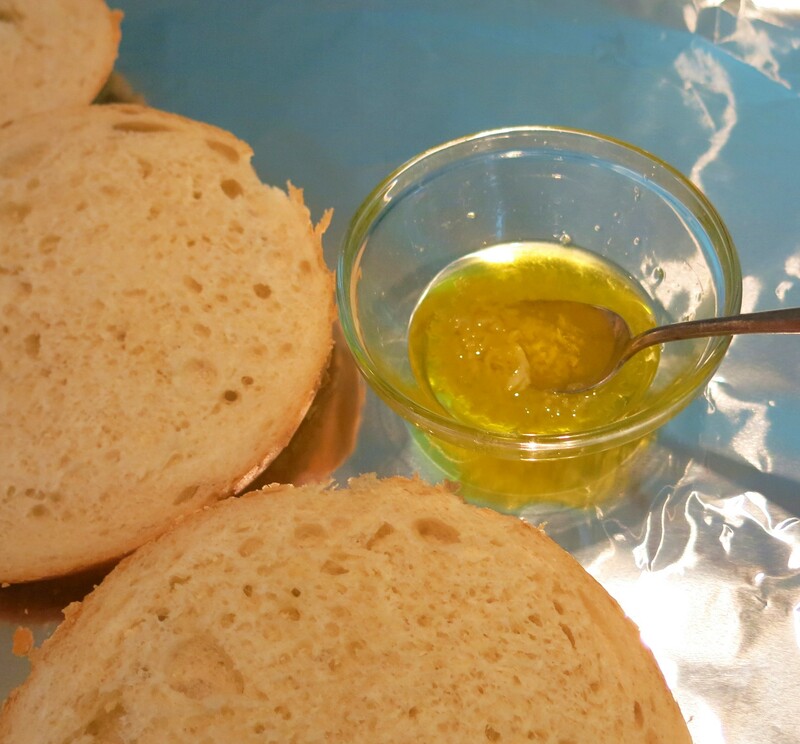 Remove the foil, place the loaf on a wooden board and slice into wedges, if desired. You can just rip it apart with your bare hands, but that’s a bit too uncouth! 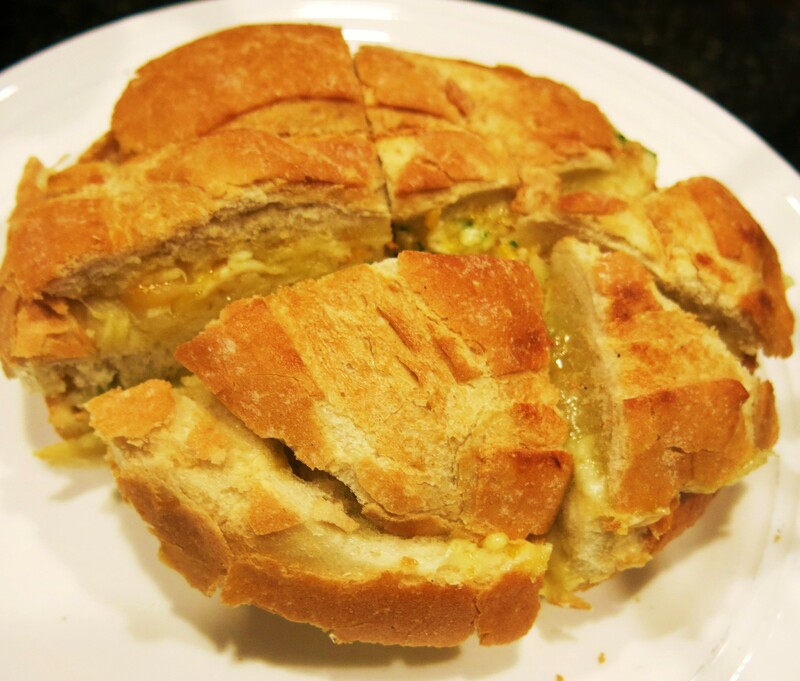 Cheese-Stuffed Garlic Bread Recipe©Marcia Lahens 2015. All rights reserved. 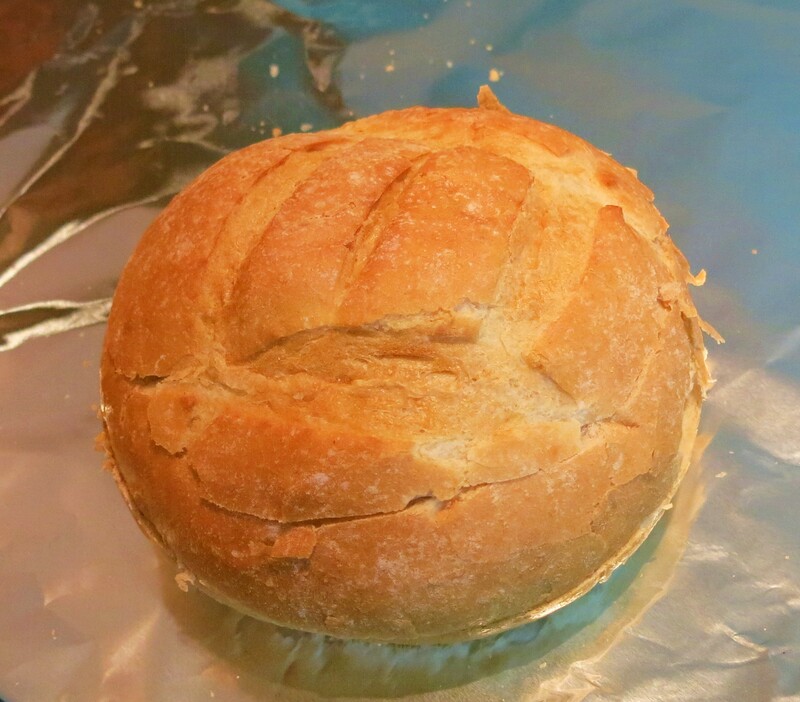 I like to used a nice crusty loaf to make this, but if you prefer a softer crust, use that type of bread. Use an oblong loaf or round, whatever you can purchase or prefer. Slice the loaf in half or thirds, depending on how thick/high the loaf is. This one was about 4 inches high. You want each slice to be about an inch thick. If you slice it thinner, then it’s much more difficult to slice when its done; it tends to fall apart. I prefer to use olive oil with the garlic, but if you prefer butter, use that. You may want to mash up 3-4 anchovies and add it to either mixture. For cheeses, us what you have on hand and this is a great way to get rid of the little bits that are leftover in bags or in the fridge. I like to use something sharp, like cheddar. Something that melts well, like fontina, mozzarella or even raclette. And something a bit firmer and dryer, like Asiago, Gruyère or Jarlsberg. I also like to use a smoked cheddar or mozzarella as part of the mix. Use good, big handfuls and just even out the cheese and make certain you get it to the edges. Feel free to crumble some bleu cheese over the center layer. I don’t use more than that, or it takes over. The optional flavor additions are too many to mention. There are those in the recipe, but I later remembered that the Caramelized Onion with Dried Fruit Jam, is mighty tasty spread over the bread. I’ve used orange marmalade and dried cranberries with sharp cheeses and some bleu…very nice around the holidays and it’s a great hors d’oeuvre, as well. Anything goes here and go, this will.